Kazakhstan is a big and vast. Thanks for that you will find diverse landscapes throughout the country. Forests and fields in the north, endless steppe in the Center, mountains in the East and South, glaciers in the South, deserts in the West. Here is a list of top 10 must see places in Kazakhstan in my personal view. 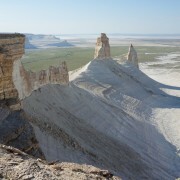 Talking with people around the world, sometimes I have been asked what to see in Kazakhstan. Now I try to put all my thoughts in one list. I have to add that Kazakhstan is a safe place as well. So, enjoy your travel! My hometown, former capital and biggest city in Kazakhstan. Almaty has unique architecture with old and new. Walk around in the city center, at the number of green parks, go to Kok-Tobe hill by cable car where you’ll find best view to the whole city. Enjoy good food and drinks in numerous cafe and restaurants. When you tired of the city, head to the mountains! Part of Tien-Shan mountains which is called Alatau mountains is just 15 minutes drive from the city. Try ice skiing at Medeu ice rink at evelatin of 1,691 m above sea level. Higher to the mountains the Shymbulak ski resort is located. In winter you may enjoy the skiing at elevation of 2,000-3,200 m above sea level. If you don’t ski, there are plenty of hiking paths to the mountains, where you’ll see outstanding beauties of the nature. For example, the Big Almaty Lake. Sharyn canyon is located 200 km east from Almaty and it takes around 3-3,5 hours of drive to get there. It is vast canyon, something around 150 km long in total. But most visitors come to particular part of the canyon called Valley of Castles, which is a 2 km long walk. During the summer there is a cafe and lodges at the end of the 2 km walk. You may also camp there. Sharyn canyon sometimes called as a little Grand Canyon and it definitely worth to visit. For some of you it might be most beautiful mountain lakes you’ve ever seen in your life. 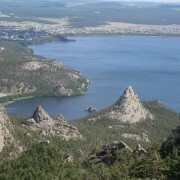 Located 330 km east from Almaty these pure pearl lakes surrounded by mountains and pine forests. You can hike from lake to another and camp in a tent. Dont’t forget to bring your own food, because there is no grocery shops nearby. Aisha-Bibi Mausoleum located just outside of Taraz city in South Kazakhstan. The Mausoleum is small by size, but it is one of the most beautiful ones I’ve ever seen. 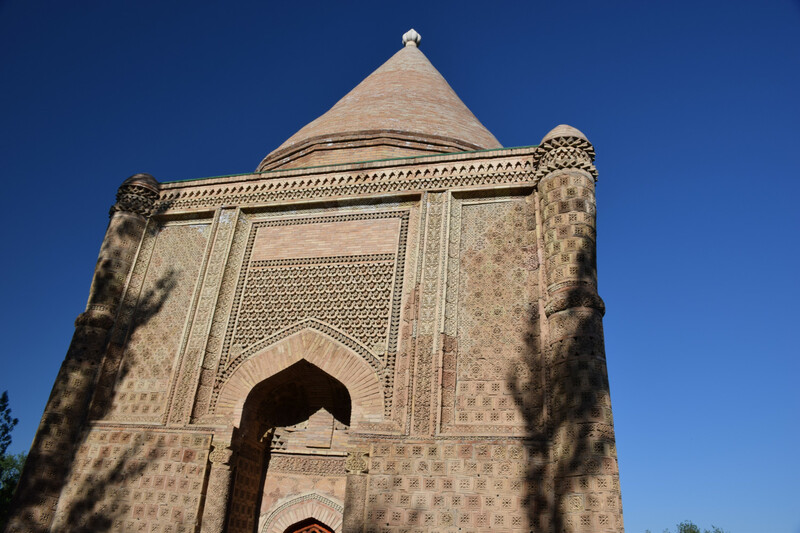 Built in 12th century, the Mausoleum is dedicated to young woman Aisha, who was died while traveling to her fiance, a powerful local ruler Karakhan. In Taraz city center you’ll also find mausoleum of Karakhan itself. 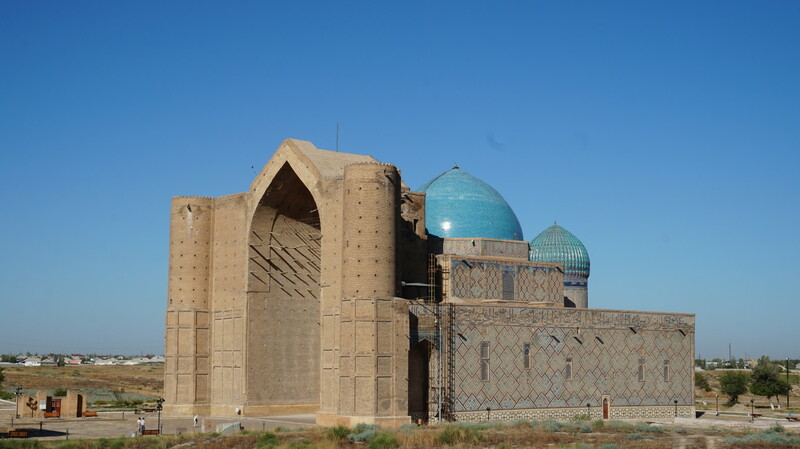 The Mausoleum is located in Turkestan city in South Kazakhstan and it’s first UNESCO World Heritage Site in Kazakhstan. Turkestan city has had its importance for long time in Kazakh history. During the Kazakh Khanate it was most important and capital city. Khoja Ahmed Yasawi lived in 12th century and was one of the greatest sufi in the region (Sufism is a mystic movement in Islam). The Mausoleum is unfinished and was built in 14th century by order of Amir Timur. The Mausoleum has biggest dome in entire Central Asia. 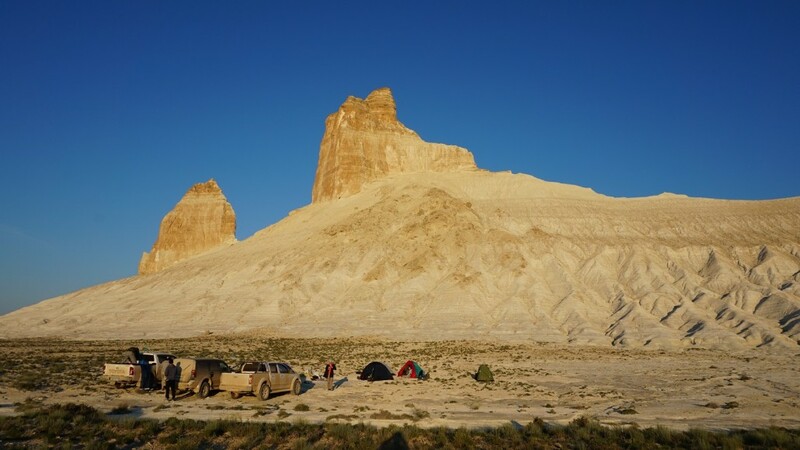 Located 100 km north from Shymkent city in South Kazakhstan. You will be amazed by the size of this cave, in fact, it’s rather a grotto — 150 m long, around 70 m wide and 30 m high. The entrance is a huge hole in the surface of a hill. There are some plants inside the cave and temperature is comparatively cool. 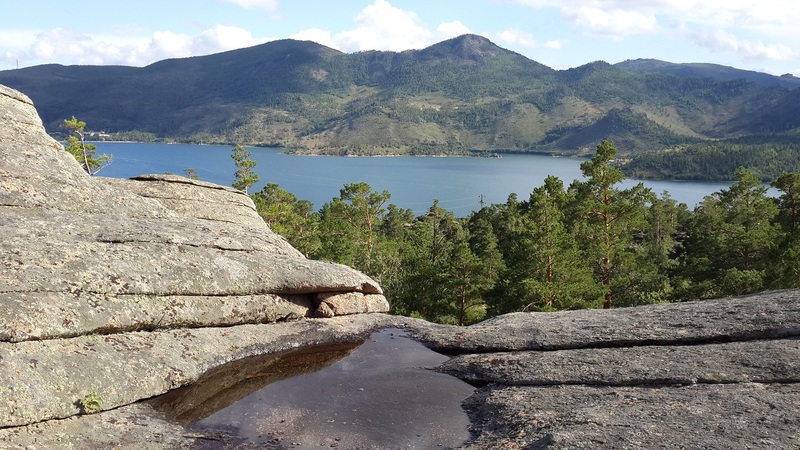 If you like pine forests, lakes and developed touristic infrastructure, then the Burabay National Park is right for you. Located some 200 km north from Astana (capital city), the place offers variety of accomodation options from 5-star Rixos Hotel to budget local home stays. Burabay is popular among Astana folks during summer time. Often this park is called as Kazakhstani Switzerland. For me, Bayanaul National Park is one of the best places in Kazakhstan. 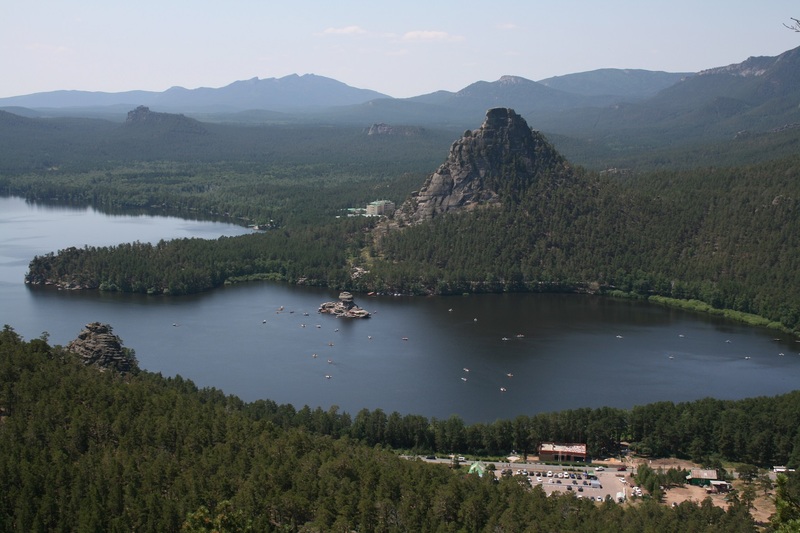 Located in north-east of Kazakhstan, the Park is vast and has beautiful landscapes, lakes and rocks. You may camp deep in the forest, hike around and enjoy outstanding scenery. 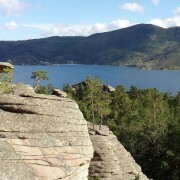 Some rocks in the Park have funny formations, which makes them a touristic attraction. This park is located in East Kazakhstan at the steps of Altai mountains. Nature is amazing there. Especially in autumn time, when trees become yellow, red, orange and green. Only here you can try pine nuts. Also, have a try of local honey, which ranks as the best in the country. Altai mountains is a sacred place, which is considered as a birth place for all Turk nations. Wild East Kazakhstan «Не думай о том, что будешь рассказывать, когда вернешься. Время — это здесь и сейчас. Лови момент», — Коэльо. На фото один из моментов Восточного Казахстана. Красивые там места! 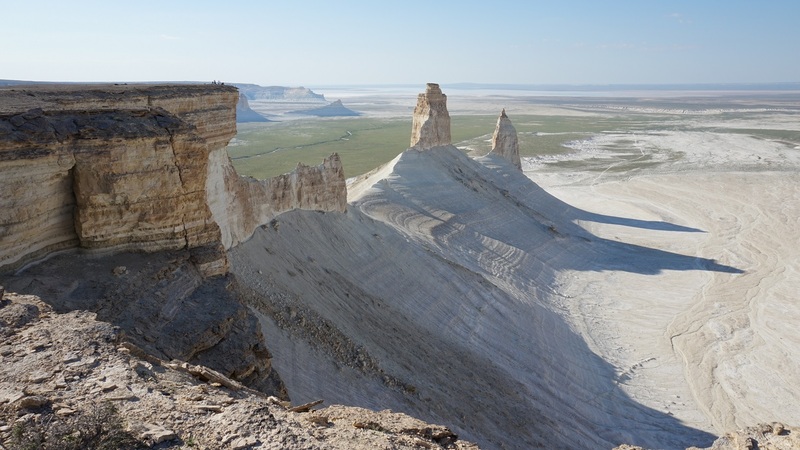 You’ll be amazed by vast area of canyons and desert. It looks surreal and like a planet Mars. Some canyons are worth visit — Bozjyra canyon, Tuzbair canyon, Sherqala. You need 4 wheel jeep to drive the area. There is also a holy place, a mosque in a cave, named after Beket-Ata. Thousands of pilgrims comes here every year to pray and make a wish. Enjoy your travel in Kazakhstan!